Bowsette isn’t the only fan creation tearing up the internet. Boosette is really making a name for herself. As Kotaku previously reported, the Super Crown in New Super Mario Bros. Wii U Deluxe led to fanart in which Bowser morphed into a new character, Bowsette. Fans didn’t stop there, dreaming up what other characters would look like with the Super Crown. A handful of other what-ifs started floating around online, but the reworked version of Luigi’s Mansion antagonist King Boo has exploded in popularity. Meet Queen Boo aka Boosette. In Japanese, fans have dubbed the character “Kingu Teresa Hime” (キングテレサ姫), a combination of King Boo’s Japanese name Kingu Teresa and the word “hime,” meaning princess. 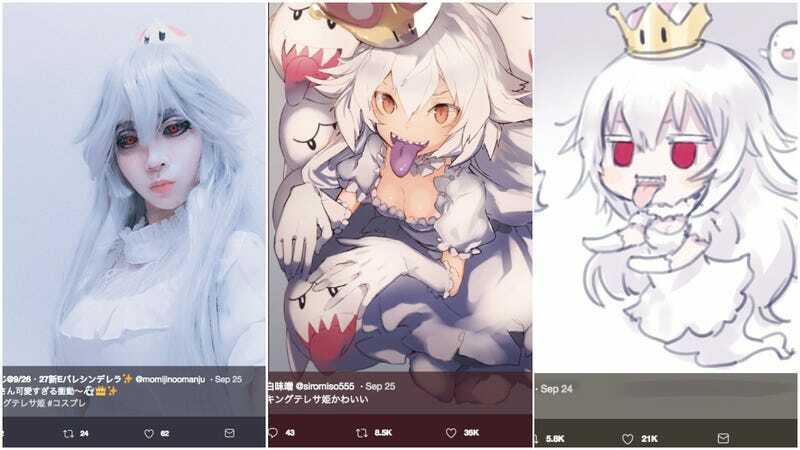 By this past Monday, Boosette fan art was going viral on Japanese Twitter. The amount of fan art is staggering. Some prefer Boosette to Bowsette. Hopefully, the two fan creations get along! Of course, there is cosplay. Meltyeye’s rendition also went viral, helping Boosette to win a rash of new fans. This might explain the appeal of Boosette. She’s shy! It’s amazing how both these characters have taken hold. But don’t expect to necessarily see them become official. Recently Japanese website J-Cast asked Nintendo about the fan creations. “As for what’s being posting online, we’d like to refrain from commenting,” a Nintendo spokesperson said. When fan art and cosplay exist, who needs the Nintendo Seal of Approval?